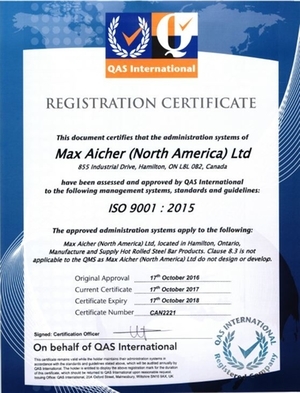 Max Aicher North America (MANA) is a supplier of hot rolled steel bar products to the North American marketplace. We have a proven track record of excellence and are committed to continuous improvement. This commitment has allowed us to become a global leading bar supplier to the North American market. Max Aicher North America is proud to be reported as one of Hamilton’s top 40 growing businesses according the Hamilton Spectator. Supporting the local job market and economy are one of our top priorities, and we offer young aspiring apprentices with programs to jumpstart their careers in the steel industry. MANA Steel's #1 Bar Mill is a modern computer controlled facility designed to produce both hot rolled bar coils and cut bar lengths. To ensure facilities continue to meet the ever-changing quality requirements of our customers, upgrades continue to be made to the steelmaking and rolling operations. MANA Steel has a state-of-the-art bloom reheat furnace, combined with an updated automated control package and new six-axis in-line laser size gauge for the bar mill. Most recently, new in-line surface quality monitoring equipment has been installed on the rolling mill to further enhance surface quality. MANA Steel also offers a wide range of technical support to its customer base, and our metallurgists are routinely involved in joint research and development activities with customers. On-site laboratory facilities are fully equipped to allow full metallographic investigations, machinability assessment, heat treatment studies, and specialized mechanical testing. MANA Steel's special bar quality (SBQ) bar products are supplied for a wide variety of applications. The automotive market includes critical components such as helical springs, stabilizer and torsion bars, steering and engine components, axles, and other shafts. Bars are also supplied to the manufacturing sector for cold heading, cold drawing, and forging. MANA is proud to be officially certified to ISO 9001:2015 standards.